The Battle of Glenumbra Moors was a battle fought between the Alessian Order and Direnni elves of High Rock in 1E 482. The events leading up to the battle were set in motion in 1E 478, when King Rislav Larich of Skingrad soundly defeated Emperor Gorieus of the Alessian Empire, subsequently inspiring Ryain Direnni to outlaw the Alessian Doctrines in High Rock and harass adjacent Imperial-held lands. The Alessians, who had been pushing their empire westward toward High Rock, were defeated by Aiden Direnni in a series of battles in 1E 480, but apparently continued their advance undeterred. By 1E 482, a vast Alessian army confronted a greatly outnumbered force of Direnni defenders to decide the ultimate fate of High Rock. Few details of the battle itself are known, but the Direnni carried the day with the help of the magic of the enchantress Raven Direnni and the military prowess of Aiden Direnni, who commanded his clan's forces. King Laloriaran Dynar of Nenalata, the so-called Last King of the Ayleids and a skilled tactician in his own right, also aided the Direnni, as well as a much more unlikely ally: the High King of Skyrim, Hoag Merkiller. The Nordic chief provided his assistance in spite of his sharing the Alessians' xenophobia, as several years before, the Alessian Empire had humiliated the Nords in the Battle of Sungard and slain Hoag's predecessor, Kjoric the White. Hoag perished in the fighting. The Battle of Glenumbra Moors ended in a decisive victory for the Direnni, with Ryain, Aiden, and Raven Direnni hailed among their clan as heroes who brought an end to the Alessians' tyranny, but it is remembered for its long-term consequences. The Alessian Order was expelled from High Rock and lost all ambition of conquering the region; indeed, so crushing was the loss that it was often considered a leading cause of the Order's decline and eventual dissolution, and ranked among the Order's greatest follies. The Direnni were weakened to such an extent by the battle, however, that they were mostly driven from the province by the emerging Breton nobility by 1E 500. Pockets of High Rock remained under elven rule long afterward, but the Direnni Hegemony was irreparably broken. The exact date of the battle is unclear. The Last King of the Ayleids gives the date as 1E 482. Five Songs of King Wulfharth notes that King Wulfharth took the throne following Hoag Merkiller's death at the battle, and a stone etching in TES V: Skyrim says Wulfharth's reign began in 1E 480. 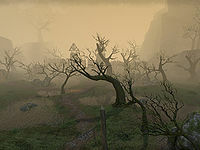 If the Battle of Glenumbra Moors did occur in 1E 480, then it might have a more direct relationship with the series of battles Aiden Direnni fought that year; Glenumbra Moors could have been either a more prolonged conflict than implied, or the most decisive clash out of several that occurred between the Direnni and Alessians.